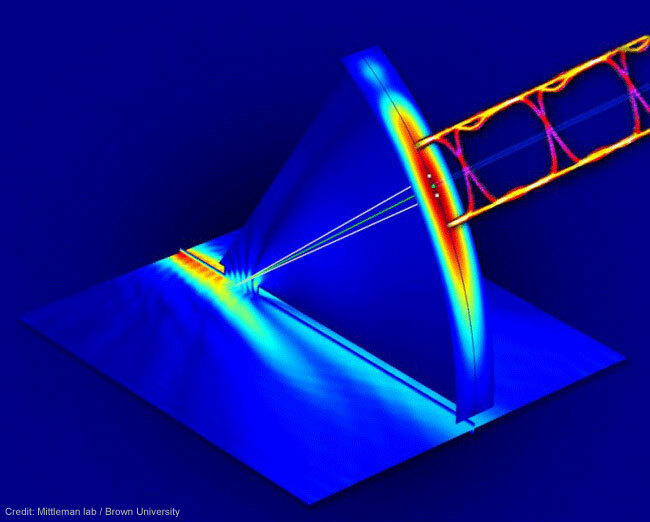 A “terahertz multiplexer” was developed by researchers from Brown University. The device was able to transmit two video signals at a speed 100 times faster than today’s cellular networks. Terahertz radiation or T-waves can transmit more data than microwaves due to their higher frequencies. Researchers will now be proceeding to outdoor tests. A budding terahertz technology offers a faster way of sending and receiving data. Researchers from Brown University were able to send two video signals through a “terahertz multiplexer” and achieved a transmission rate of 50 gigabits/second. That is 100 times faster than the optimal rate of today’s cellular networks. The paper was published in Nature Communications. The technique of multiplexing allows transmission of multiple signals over a single channel. (Thanks to multiplexing, one email you send will not get mixed with that sent by your neighbor.) All incoming signals are aggregated into a single one via a device called a “multiplexer” (or “mux”). A multiplexed signal is sent through a shared channel (like a telephone line, cable or wireless network) before it gets broken down into individual signals by an another device called a “demultiplexer” (or “demux”). This is how one cable can carry multiple TV channels or a wireless network can be accessed by multiple users. Multiplexing is a big part in areas like Internet, digital broadcasting, wired and wireless telephony. At present, cellular networks rely on microwaves to transmit wireless signals. However, microwaves won’t be standing for long as the demand for data transmission is steadily increasing. Five years ago, Tokyo Institute of Technology scientists studied terahertz waves (also known as T-waves, terahertz radiation or T-rays) and saw their promising applications in the field of telecommunications. T-waves are electromagnetic radiations whose band lies between microwaves and infrared light. Compared to microwaves, they have shorter wavelengths, higher frequencies and bigger capacities to transmit more data. The terahertz range is 0.1 to 1 millimeter, which is why T-waves are also called “submillimeter radiations”. While T-waves are indeed promising, terahertz technology is still young and lacks basic components like a mux/demux system. To demonstrate how a terahertz multiplexer works, Brown researchers built a small-scale waveguide (a device to confine and “guide” radiation) from two parallel metal plates (one plate has a slit). Some of the T-waves were observed to leak out from the slit. The leak angle of a T-wave is dependent on its frequency. This angle-frequency correlation has become the basis for a terahertz mux/demux system. Theoretically, T-waves of varying frequencies can carry different streams of data without interferences (this is mux) and they will leak out at different angles to transmit the data (this is demux). In a practical scenario, a data stream can be transmitted through a specific frequency and can be leaked to a specific target through a specific angle. While researchers were successful in experimenting with T-waves, they still had to apply the mux/demux concept on real data. By collaborating with France’s Institut d’Electronique de Microélectronique et de Nanotechnologie, they encoded two video signals into T-waves of 264.7 and 322.5 Ghz frequencies. Switching from one frequency to another, a TV receiver was able to broadcast the two signals in turns. The transmission was free of errors up to speeds of 10 gigabits/second; this is already faster than today’s Wi-fi speeds. However, errors start appearing at 50 gigabits/second but this kind of situation is fixable by today’s networks. Furthermore, the leak angle must be accurate in order to decrease error rate. What is exciting about the study is that this is the first time multiplexing is done with T-waves and it is going to be terrific for the future of wireless technology. The team which recently received a license from the FCC to perform outdoor tests at terahertz frequencies, said they plan to perform terahertz frequency tests in an outdoor setting.